Revision manager – Initiates a change to the application by creating a revision and the associated change requests. The revision manager approves change requests, submits completed revisions, and deploys revision packages. Strategy designer – Amends the business rules that are part of the change request and creates rules, if required. When the changes are done, the strategy designer tests the changes by running test flows and simulations, and, if satisfied with the results, the strategy designer submits the changes to the revision manager for approval. Decision architect – Reserved for decision management experts. The decision architect has access to all system capabilities. The decision architect is typically active in the business sandbox but can also monitor the application in a production environment. The decision architect role often includes revision manager and strategy designer responsibilities. System architect – Creates the application overlay, which contains all the rules that can be included in a revision. The system architect can also deploy revisions in a production environment. Revision Management – This type is equivalent to the original authoring experience of the operator in revision management. In this delegation experience, the assigned operator has a restricted rule form available for editing. Complete rule form – This type is the most permissive delegation experience in which the complete rule form is available. Select this delegation experience type if the change request requires advanced configuration of a rule, such as altering parameters, or changing the configuration of the Specifications or Pages and Classes tabs. One of the standard Pega 7 Platform delegation experience types that are available for certain rule types such as Map Value or Decision Table. 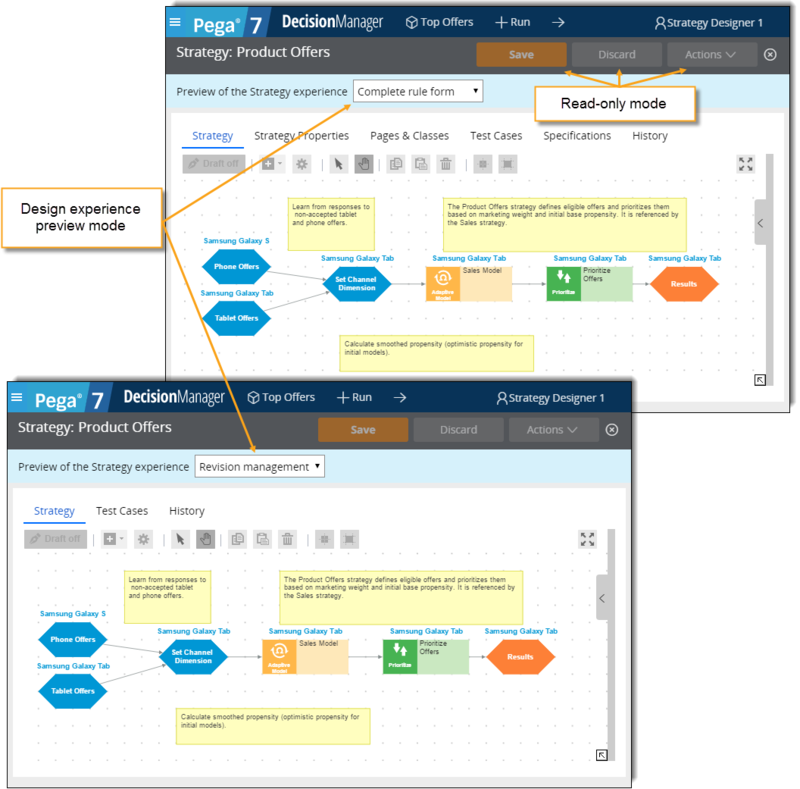 From the Experiences tab of Revision Management, revision managers and strategy designers can preview the delegation experience types for each rule type. Each experience type is accompanied by a brief description and a button for previewing the rule in that delegation experience. The preview is unavailable if no rule of a specified type is included in the current application overlay. Rules that you access from the Experiences tab are displayed in read-only mode. You can toggle between all delegation experience types. You can assign a delegation experience type to a particular rule in your application during the Refine selection stage of change request creation. If you include multiple rules in a change request, you can select a different delegation experience type for each of the assigned rules. The delegation experience of each rule that is assigned to a particular operator persists and cannot be changed during the course of a change request. When the assigned operator opens a delegated rule, the rule always opens in the assigned delegation experience. However, when an operator creates a rule, that rule opens in the complete rule form until that rule is submitted as part of a revision. In this way, the operator can configure that rule without the need for the revision manager to create a change request and assign the required delegation experience. When the new rule is submitted for approval as part of the change request, this rule always opens in the complete rule form delegation experience because it opens in read-only mode.